In this post, I’m going to share with you the 10 most powerful headlines formulas that when you apply each one correctly into your next blog post or any copy – either offline or online – your audience response rate will no doubt double or even triple. According to InternetLiveStat, there are over 4 million blog posts published daily, 4 billion Google searches performed daily, 5oo million tweets, and 700,000 YouTube hours of video watched on any given day. This means that each time you hit the publish button on your blog, send a tweet or post a YouTube video… you’re actually competing for attention with millions of other web pages. You need a very strong compelling article headline. The type that can NEVER get ignored. A little tweak in your headline copy could possibly lead to 40% increase in your conversion rate as reported by Neil Patel for the KissMetrics blog. And according to an authority blog on the subject of headline copy, 80% of people who come in contact with your article will only read the headline, only 20% will go on to read the rest of the content. If this doesn’t convince you enough, know that 50% of your content success lies in it headline effectiveness. So, how do you write article headline that gets your readers just want to read the rest of the content? I use the word "borrow" for a purpose…not many of us "bloggers/content marketers" will be Neil Patel or Brian Clark of this world, but we can leverage on their credibility or authority to build our own blog. Take a look at the different headlines below and ask yourself which of the two categories of headlines would you click on? 24 Content Marketing Hacks Neil Patel Uses to Build a Six Figure Income Business. How Brian Dean of Backlinko Generates 50,000 Search Traffic Monthly With Only 32 Blog Posts. Case Study: How JeffBullas Generate 10,000 Unique Twitter Traffic From Sending Only 1 Tweet. 24 Content Marketing Hacks to Grow Your Business to Six Figure Income. How to Drive 50,000 Organic Search Engine Traffic from Google Monthly. How to Get 10,000 Unique Twitter Traffic from Sending Only 1 Tweet. The difference between the two headline categories is that one is backup by an expert credibility – an authority figure on the subject. This provides the readers with the assurance or guarantees that the information she is about to read is the work or scientific fact of an expert who knows the subject like the back of his palm. While the other headline category is good to go too, they lack credibility and expert’s backup. According to a report conducted by Content Marketing Institute, content headlines with a colon or hyphen within them performed 9% better over content headline without a colon or hyphen in it. An article headline with a colon lets you put the relevant answers or words your audience is asking at the beginning of your content headline while the rest of your words could go after. And this is also a good strategy for improving SEO traffic as search engine algorithm put more emphasis on the words (probably your focus keyword) that come at the beginning of your page title. In the example below, Brian Dean strategically put the page focus keyword "White Hat SEO" at the very beginning of the content headline and uses a colon to form a "sub-title". This also speaks to the reader quickly that the content of this page is all about using white hat SEO techniques to get search engine #1 ranking. If you go through the top blogs in your industry and take a look at the all-time most popular posts in the sidebar, you’ll notice a good part of the list consist of content with number list in their headlines. According to a research carried out by the Conductor Blog, findings show that one of the key factors that led to content going viral is when numbers or figures are present in an article headline – a list post. This shouldn’t come as a surprise to you because as a reader, list post makes it easy to digest the information better and gives a clear idea of what to expect on the page. And the best part of list post is that readers can quickly skim through it, get all the facts, lessons, and details without having to read through the whole paragraphs from top to bottom. Your headline formula should go beyond just passing out information to your audience; it should influence the reader to take certain action that you want from them. Recently at CoSchedule, a study of 1 million content headlines was carried out. 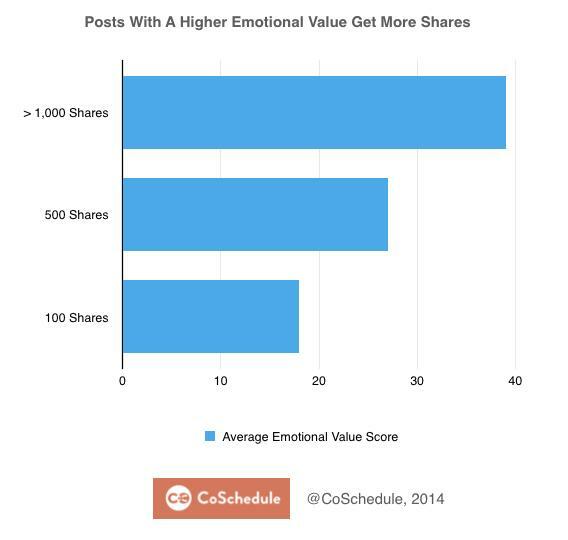 After conducting the research, combining the 1 million headlines content in their database with a new social sharing analytic tool, result shows that post with higher Emotional Marketing Value (EMV) get the most shares. 3 categories of sample post were used to perform the test – post with over 1,000 shares, post with 500 social shares and post with 100 shares. How can you play on your audience’s emotion in your content headline and still make them rushing to read your content? Use words that resonate with your reader’s emotion during the different stage of their buying cycle, situations, and circumstances. Starting a blog, at least to 95% of people who take the step is aspiring to earn their living online. So a blog in itself is just a means to an end not the end itself. But many who started their blog never earn a reasonable income from it to enable them to quit their day job or even pay for the blog hosting renewal fees. As a smart content marketer, you can take advantage of this ugly situation this set of bloggers are in to write a very compelling headline offer that deeply resonate with them and get them do just one thing: "click". How to Start a Blog, Quit Your Day Job And Travel The World Around. Make Money Blogging: How to Go From Zero$ to $10k Monthly in 6 Months. How to Make Money from Blogging and Live The dot com Lifestyle. The fear of poverty, the dream of earning great income online, and the joy or lifestyle the dot com world would eventually bring to family and loved one will play a big role in the overall response rate to such headline. These emotional words do not only apply to your content headline alone but throughout your content body too. No matter how useful or in-depth your content is, if the headline doesn’t move people to click on it, it won’t get read. Here is a list of 317 power/emotional words put together by Jon Morrow. Nobody wants to waste time figuring out what the content is all about if your audience can’t get the answer to their problem just by reading your content headline. Your content headline should speak directly to your prospect what’s in it for him and why he should read the rest of the article body. This is one of the reasons the "How-to" articles perform well because they provide a specific answer to a unique question. Your audience is asking questions using various online medium and the better you can provide a real specific answer to these questions, the more chances you get converting them to loyal subscriber and blog readers. #6. Tell Them The Content Format. With people’s attention span decreasing to 8.25 seconds, according to a report by StatisticBrain, and other content formats (video, infographics, podcast, memes, eBook, etc.) competing for a share of Internet traffic. It becomes so necessary that you indicate in your headline title what type of format the content is, if you’re presenting the information other than text. Traditionally, people assume most content to be in text format, but with the rise in infographics, video, podcast etc…We’ve seen a significant shift in how people consume content. So, to save your audience time and attract the right people to your content (this is valid if your content is in other formats other than text) indicate at the beginning of your headline the exact format of your content. While you’re applying this simple trick, don’t forget to insert colon or hyphen after it to break it away from the main article heading. This simple headline tips can easily make the big different in your audience bounce rate and improve conversion for nearly 100%. #7. When you update an Old Post, Use this Word. Most bloggers are losing out on additional or free traffic when they update their old blog post with more content or writes another version of it to meet with today’s demand. Remember I told you above that a single tweak in your headline formula could lead to 40% increase in conversion and traffic rate? Here is one little tweak that can make that happen when you update your existing post with more content. There is one marketer that has taken this to another height with his published post, that’s Brian Dean of backlinko. If you’re a regular reader of his blog, you know Brian is used to updating the old blog post with more relevant content. Each time he updates a post with more content, he updated the headline too with the simple word "updated" and send a message to his email list. How does this simple tactic help increase backlinko traffic? I should know, I’m one his subscriber. Even if I have read the original version of the post in the past, but when I see the same article headline with the word "updated" added to it… I probably want to see what’s new in it and this means additional traffic to the same article for the backlinko blog. So when next you update an existing content, don’t forget to add the one word "Updated" to it. #8. Infuse Urgency And Scarcity. This type of headline formula works best for the e-commerce website or when you’re about to launch the sale of a product and during the same period. The main purpose of such headline is to get people to click immediately no matter what they’re on to at the moment. You make them feel the product is not going to be around for long, or now is the best time to get it. But before urgency or scarcity could work the magic in your content headline, there are other factors that are needed to make it work. No matter the degree of urgency or scarcity you infuse in your content headline or offer, people won’t buy from you or take any further positive action if they don’t already know and trust you; your product offers useful benefits and is well targeted or relevant to such audience. A good example of real urgency or scarcity is the annual summer discount sale of SEO Powersuite SEO tools which usually goes on for 70% on the first day. In reality, you have just 1-day to make the purchase or wait till next summer when the 70% discount sale is re-opened. That’s real urgency – no hype. Implied are the most commonly used and the type you see smart online marketers used to get the prospect into buying mode. Marketers used power words to nudge potential buyer to take buying action now. Actually, there are no deadlines. Is just a smart marketing tactics to get more sales and improve conversion. #9. Get Your Ideal Word/Character Length. If it doesn’t fit in a tweet, is too long. Well, as true as that could be it might not apply to every industry, copy or event. When it comes to the ideal length for an article headline, there is never a right or wrong ways to do it. It all depends on what are your goals and the platform you’re promoting the content. In fact, a school of thought suggested that you should craft out different headline copy for different social media platform you’re promoting the content. In 2013, OutBrain analyzes 8 months of data click-through rate of paid links on their networks and find out that headline length greatly impacts engagements. After analyzing 100,000 headlines of English language paid links on the OutBrain networks, finding shows that headline within 60-100 characters perform better. Engagement decreases as headline characters get lower than 60 or goes beyond 100. #10. Arouse Curiosity and Suspense. Agreed, your headline should be direct and quickly convey the message to the reader but, it shouldn’t leave everything in the open. This is because if your headline summarizes everything that is in the body content – there might be no need of checking out the rest of the content. Take this headline content for example. 1.5 billion Users log in daily on Facebook, says Mark Zuckerberg – Facebook CEO. You’ve told me all I need to know about how many users log in daily into their Facebook account and are good to know that this announcement is coming from the Facebook CEO himself. A curiosity or suspense headline will grab the attention of a reader by presenting a claim or benefits that on the surface, seems impossible, remarkable or too good to be true. By this, it arouses some degree of doubt or unbelievable thought in the reader and triggered the emotion of curiosity which results in taking positive action like clicking through to read the rest of the content. A curiosity headline won’t give everything away – the reader must click-through to find out what really happen. I don’t see what will ever make anyone ignore such a headline. There are lots of questions begging for answers upon viewing such headline that will make you just click on it. UpWorthy, a website known for coming up with the most intriguing headline formulas are a perfect example for headlines that mostly arouse readers curiosity and drive them to just click it. No matter where the writing may take place, email newsletter, blog post, landing page, sales page, Social media marketing etc…The headline is the bridge that connects your content with the reader. Every other aspect of the copy matters too because there is no point in getting the reader to click through only to have mediocre or non-relevant content on the page. Getting your content headline right is just one part of your overall content strategy, every other aspect of your content development strategies must work together to achieve one main goal.